In my honest opinion, there are few foods in this world that can take a person back to the lazy, hazy, crazy days of summer as effectively as a delicious, fruit-filled cheesecake. 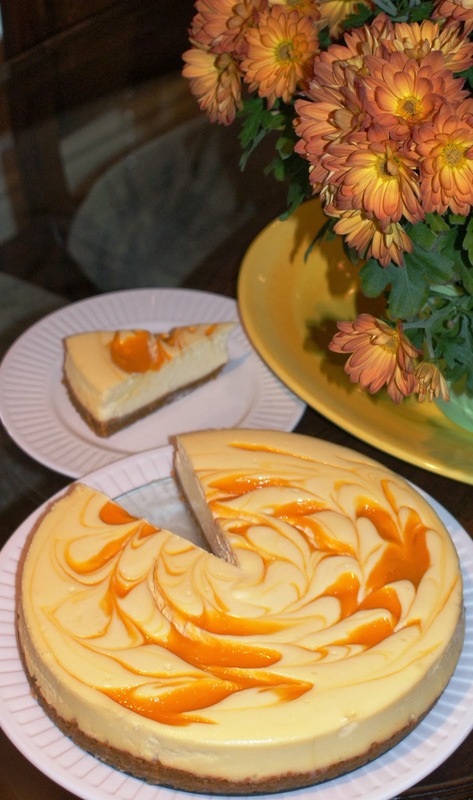 I made a mango cheesecake some years ago during the summer using fresh mangoes, but I’m convinced that the frozen fruits available in the grocery stores these days make this cheesecake recipe just as good year-round. Cheesecake cam be a daunting prospect for many new bakers; we have all had our “fun” with cracked, burned, or goopy cheesecakes, and that can scar a girl, ya know? However, with a few little tips I learned from my Pastry Chef professor on how to make a perfect cheesecake (listed below in the recipe), you too can make a sublime creation fit for royalty! Preheat oven to 325°F (160°C). Grease and line standard springform pan with parchment paper circle on bottom, and with another strip of parchment paper make a 3-inch “cuff” along the inside rim. Tear off a sheet of extra-wide aluminum foil (or fold two together to make a waterproof seam), and wrap the bottom of the springform pan and up the sides of the pan securely to form a watertight seal. Stir together ground graham crackers, butter, allspice, and 3 tablespoons of the sugar. Press crust mixture firmly into bottom of pan. Bake until set, about 15 minutes. Transfer pan to a wire rack to cool. Process thawed or fresh mango chunks, water, and allspice in a food processor or blender until smooth, about 30 seconds. Add 3 tablespoons of sugar and cook puree briefly over medium heat, stirring constantly until mixture becomes thick and syrupy. Let cool, then push puree through a fine sieve into a small bowl, pressing with a spoon or flexible spatula to remove as much liquid as possible; discard solids. With an electric or tabletop mixer on medium-high speed, beat cream cheese until fluffy, scraping down sides of bowl as needed. Change mixer to low speed, and add remaining 1 1/2 cups sugar in a steady stream. Add salt and vanilla; mix until well combined. (TIP #1) Sprinkle flour over-top the mixture as mixer is running. Add eggs, one at a time, beating until just combined after each. Scrape down mixing bowl as needed. Pour filling over crust. Dollop teaspoons of mango puree randomly over the area of the batter. 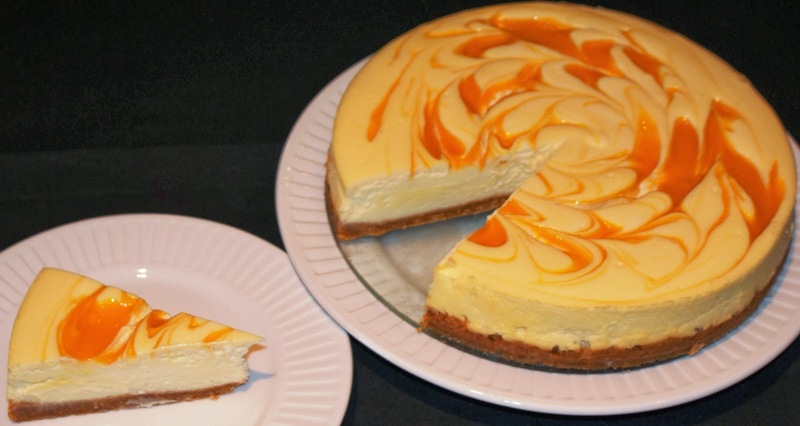 With a wooden skewer or butter knife, gently swirl the puree into the cheesecake filling. Place springform pan in a roasting pan; pour enough hot water into pan to come one-half of the way up sides of the springform pan. Bake, gently rotating pan halfway through, until the filling is almost set (slightly jiggly in middle), about 35-40 minutes. (TIP #2) Turn off oven and leave oven door propped open with a wooden spoon until cooled down (45 minutes). Carefully remove pan from oven and water bath, and transfer to wire rack to cool completely. Run knife between edge of pan and cheesecake to loosen from sides. (TIP #3) DO NOT REMOVE OR LOOSEN SPRINGFORM PAN! Refrigerate at least 4 hours before serving (overnight is best). Remove from pan just before serving. *NOTE: Allspice is a tropical spice that pairs well with mangoes; however, feel free to mix it up with other spices you may like more, such as cloves, nutmeg, cardamom, cinnamon, or mace.